Carefully, take your curtain pole and hold it above the window where you want your curtains to hang. Mark where the fittings need to affix to the wall. Going by the marks you've just made, drill the required amount of holes for your curtain pole to be screwed to later. If needed, you can use plastic plugs to lessen the diameter of the drilled hole - this makes the screws sit tighter in the wall, making your curtain pole more secure. Hold the part that supports the pole against the wall, lined up with the holes you've drilled, and affix the two with the relevant screws. Your curtain pole is now affixed and ready to use! Carefully, support the curtain rail above the window so you can see where you'd like your curtains to hang. Ensure that the overhang distance above the edge of the window is symmetrical, else the curtains could look a little amateur when open during the day. Firstly, remove all the hooks from the rail, and place them with your curtains. With a drill, affix the rail to the wall with the appropriate fixtures, ensuring that the rail is level as you do so. 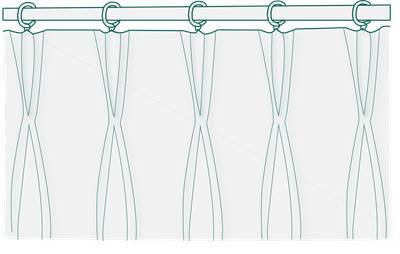 If designed for a curtain rail, your curtains will have lots of threads at the top. 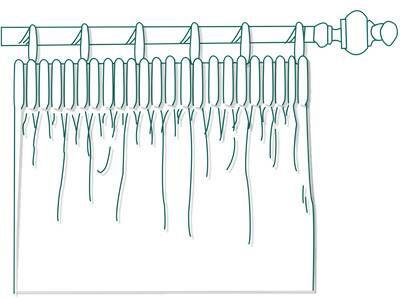 Weave in the hooks at the same height the entire way across, allowing for an equal amount of hooks on each curtain. Though you will have done this in the ordering stage, the first thing you need to do when looking to hand your pencil pleat curtain is make sure that measure the total distance that needs to be covered by each curtain, and add 75mm to allow for overlap and spring back. Be sure to check the tape cords are securely attached to each end, before easing the cords free - one form the right side of one curtain, and one from the left curtain. Remember to always ease the cords away from any half widths in your curtains, so that the join falls away from the centre of the window. This provides a much neater finish. Hang the eased cords out over a secure, protruding object like a door handle, and draw the heading tape back along the cords creating pleats as you go. Once you've drawn the tape back to the correct width, you can focus on arranging the curtain fabric to form pleats. Be sure to tie the cords loosely when you're done, but do not cut them. You may need to rearrange them at a later date, and you won't have the cord length to do so if you cut them. Insert the hooks approximately 75mm to 100mm apart, using the hooks that would have been supplied with your rail or track. Select the best pocket on the multi-pocket tape, to achieve the required hanging position. Once done, simply hang - and your curtains are ready to use! As our triple pinch pleat curtains are delivered ready to hang, all you need to do is attach the hooks that came with your curtain pole or track. 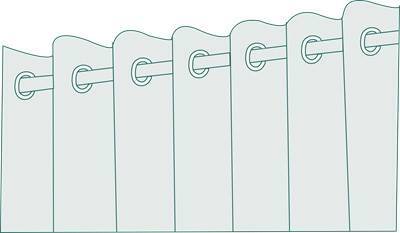 Firstly, calculate the first pin hook height on the buckram strip to achieve your desired hanging position and then insert the remaining hooks at the same height. Then simply hang the curtains on the pole or track. Finally neatly arrange the pleats into neat uniform folds. As our eyelet curtains arrive ready to hang, all you need to do is feed the eyelet onto your curtain pole! Be sure to arrange the fabric into neat folds while hanging for a finished look. TIP: All curtains will need time to settle and look their best. To help in this process we recommend you take some time to arrange your curtains into neat, even fullness folds for the first few days. Eventually you will build a 'memory' into the fabric and the curtains will hold their look.